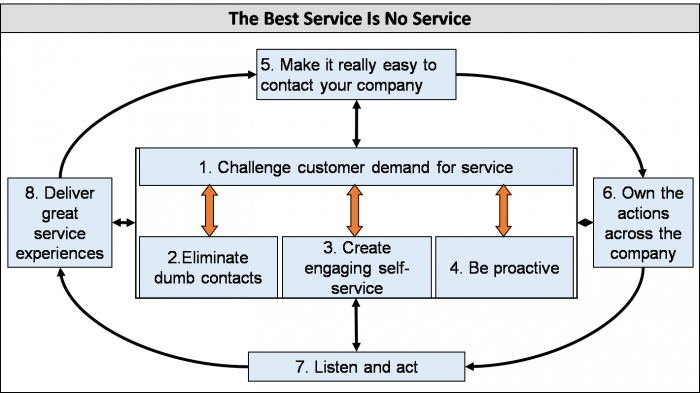 Ten years ago when we published The Best Service is No Service: Liberate Your Customers from Customer Service, Keep Them Happy, and Control Costs (Wiley/Jossey-Bass 2008) we suggested that organizations needed to work harder to reduce the demand for customer contact rather than spend so much time and effort “dealing” with those contacts. These ideas have become even more relevant today with the explosion of smart mobile devices, apps, and text messaging, and the continued increase in customer expectations and the need to improve “Customer Experience”. We’ll discuss how the Best Service ideas apply in a multi- and omni-channel world, and the extent to which it’s become harder to address the ideas we set out. We will review how new technologies such as analytics have made it easier to apply some of the concepts we proposed and describe cases in which these technologies have been applied successfully. What are The Best Service is No Service ideas, and are they still true today? Best Service stemmed from many years of observations and studies across organizations all over the world, some struggling and some stars already. We found that the majority of customer interactions were driven by issues, problems, misunderstandings, or transactions that companies could have prevented or that customers could have handled with self-service. “Challenging demand” was the right starting point because you first have to understand customer demand for support and start asking a series of “Why?” questions. Interactions today have grown to include calls, emails, chat, store visits, texts, and social media so there is much more to understand. This spread of channels has happened so quickly that many organizations are too busy dealing or coping with the demand and haven’t had time to challenge it systematically. We know only a few companies that have effective reporting of what drives contact in individual channels and even fewer that can report demand drivers across all their channels. It’s also got harder as customers now start in one channel and then jump to another one, making the demand picture more confused, the “omni-channel dilemma” that we cover later. Log and report causes of contact and look to understand and reduce the causes (they “challenge demand”). Have worked hard to get rid of “dumb contacts” by cleaning up bugs and confusing wording on the site. See “self-service” as their key channel to market, and every email and chat as an opportunity to improve their website and enhance the self-service experience. Built product rules and email and SMS notifications to “be proactive” and keep customers informed. Bring all parts of the business together to “own the actions” in monthly review forums, recognizing that customer service isn’t the root cause of 80-90% of the contacts that occur. This start-up is perhaps better placed because it has built its channels and processes with “No Service” in mind. The net result has meant that contact growth is flat, while customers and transactions grow at over eighty per year. Interacting with them has become easier, and their rate of contact and costs per customer and transaction is falling dramatically (in the book we call that CPX). In contrast to this start-up business, larger legacy businesses have often responded to customers’ channel needs by adding new contact channels as silos. They have “made themselves easy to contact” (as we prescribed) but they are now dealing with the new demand in these new channels, rather than addressing the causes. Many have tried to make these new channels cheaper by locating them offshore; however, that doesn’t mean this is “good contact” that shouldn’t be challenged. Perhaps that is why many organizations are starting to use the next wave of automation such as chat bots and robotics (RPA) to handle demand that they haven’t managed well (see Bill Price’s recent CustomerThink post on RPA1). These new tools extend the idea of creating engaging self-service in new directions. “Listening and acting” has been an area of huge investment over the past 10 years. Post-contact surveys and “transactional NPS” measurements are “listening” mechanisms that have proliferated. Unfortunately, many organizations have confused “keeping score” on agents and themselves with true listening. Worse, they have forgotten about the second part of listen and act, namely acting on what customers are telling them. To us listening is about being open to suggestions from customers and their collective voices through calls, emails, complaints, and many other “sources”. The scorekeeping trend and limited improvements in those scores as shown in the ACSI surveys, JD Power scores, and even many companies’ NPS, suggest there is a lot more to do. One business we know is using speech and text analytics to mine the voice of the customer in each channel and across all channels, producing agent- and issue-based first contact resolution (FCR) instead of dull averages that do not signal where to improve, and where to praise excellent performance. You can read more in the CustomerThink article by Bill Price2. The potential benefits of applying the Best Service ideas have increased because customer contact channels have proliferated and customer expectations increased, but It has also become more complex. Organizations now need to bring together common contact causes and related contacts across multiple channels in order to understand the total cost and volume of customer contacts and to discover and attack common root causes. These contacts are often in different systems and have different business owners. The mechanisms we set out in The Best Service is No Service can be applied to multiple channels simultaneously. For example, the “Value-Irritant Matrix” shown below can be used to look at the value of interactions to customer and organization regardless of channel and across all channels. Today companies are creating omni-channel versions of this matrix so that they can see the total cost and impact of contact categories across channels and within them, as well as adding “related” costs that stem from a contact such as downstream processing or dispatching a technician. In short, this quickly produces for them the “R” of a stronger ROI argument; e.g., the true cost of a call such as “My modem is not working” could include sending a replacement to the subscriber’s office or sending a technician to their home to investigate the situation. It’s become hard to create these “integrated views” of volume and cost because the channels have evolved separately with different systems, contact categories, and reporting, creating the “omni-channel dilemma” of not being able to identify the same or related contacts in different channels. The omni-channel world has also created new contact categories and changed why contacts occur and the channels where they start or stop; e.g., now that customers with banking apps can check their balances many times a day they identify different issues and problems: Customers used to ask, “What’s my balance?” but they now say, “My balance is wrong because of….”, and query transactions they don’t recognize or the timeliness of transactions. Some companies are very proud of having shifted a large percentage of interactions from email to chat, but customers only click to chat if they need help or something is wrong. The same approach that we suggested ten years ago to eliminate “dumb” phone calls or email messages now needs to be applied to chat, messaging, and social media. Customers don’t want to chat any more than they wanted to call or email. The omni-channel world, therefore, means that The Best Service is No Service philosophy now has a bigger and more complex problem to solve, since it spans multiple channels and systems and possibly even more stakeholders in an organization. We know the problem hasn’t gone away: in most cases the number of staff handling contacts of all types, relative to revenues or customers, has hardly changed despite considerable investment in new contact channels. Aa already noted an exciting range of new tools and technologies is delivering new solutions to enable The Best Service is No Service ideas to work. For example, a US cable TV company solved the problem of how to understand and monitor contacts across channels by using the text analytics to automate the “Why are our customers contacting us for support?” There was a lot of “out of the box” frameworks in the text analytics engine but the company’s Customer Operations team had to train the engine to address its range of products and services. Today every channel is being converted to text regardless of their source, with the engine providing better insights and waves of process improvements, following The Best Service is No Service framework, with contact rates having fallen by almost 30%. These text analytics technologies are a breakthrough since they mean that organizations can bring together all contact types and “voices”, analyze them in a consistent way, and reduce the need for frontline staff to “code contacts” or to add “reason codes”. For channels such as email, social, and chat that are already text-based, text analytics makes it easy to bring the channels together with a common taxonomy; more advanced techniques such as linking different parts of contact history creates a true cost of contact for each reason code. For example, that US cable TV company now adds the cost of a “truck roll” to the call asking for technical support. Once the true end-to-end costs become clear, the benefits of solutions are also easier to prioritize. The latest technologies have also broadened the solutions in areas like proactivity and self-service. It’s been great to see that the range of proactive contact channels has increased (e.g., SMS-text, email, messaging, and alerts through apps to warn the customer of issues, transactions problems, or work status). These mechanisms are inexpensive and reliable, and they avoid many of the “Where is my …?” and “Why haven’t you …?” reason codes. They have also put customers in control. The range of self-service options has also increased, e.g., links to videos and web sites that provide far more powerful and engaging forms of customer education than do brochures or manuals. In addition, tools such as QR codes, voice biometrics, and allowing customers upload photos or to scan purchase receipts provides an even richer set of solutions. Chat bots and A.I. have also expanded self-service options: Rather than static pages of text in which customers have to hunt for relevant answers, the latest chat bots offer a more tailored solution to customer queries with a narrow list of FAQ options that “learns” if the recommended solution works (because there is no downstream contact with customer support), thereby increasing the “FCR” on the web and achieving what we like to call ZCR = zero need for agent contact handling and resolution. We believe that The Best Service is No Service strategy is now even more essential for businesses and government organizations. The growth of channels and constant change in customer needs and expectations makes understanding and managing customer demand even more important. Luckily, the tools and methods to tackle these issues have improved and we have refined the techniques that can be applied. Bill Price is the President of Driva Solutions (a customer service and customer experience consultancy), an Advisor to Antuit, co-founded the LimeBridge Global Alliance, chairs the Global Operations Council, teaches at the University of Washington and Stanford MBA programs, and is the lead author of The Best Service is No Service and Your Customer Rules! Bill served as Amazon.com's first Global VP of Customer Service and held senior positions at MCI, ACP, and McKinsey. Bill graduated from Dartmouth (BA) and Stanford (MBA). I agree with you that “The Best Service is No Service” is a great strategy; it’s also a bold brand promise of Amazon. However, I’ve a big question mark whether Amazon is a customer-centric company. Years ago I ordered 12 books on Amazon.com delivered via sea shipment to Hong Kong. But I received only 11. I emailed them. Without a single question, they couriered the missing book the next day by FedEx. I believe a lot of customers sharing similar amazing experiences. It’s difficult to find any rivals to compete with Amazon on ‘fast and easy’. They’re delivering “all pleasure, zero pain” experiences with the cheapest prices. They are customer-centric, aren’t they? However, “Amazon is customer-centric” is valid only if we ignore the (potential) negative impacts: collecting our BIG Data and becoming BIG Brothers, and turning into monopolies in different industries and domains. They’d become too rich, too powerful and too big to fall. Are these not the critical concerns of any customer with conscience? Would Amazon proactively do anything to address the above critical concerns of customer? I doubt it. Don’t get me wrong, I won’t complain Amazon for that. After all, there’s no free lunch. I’d attribute Amazon’s huge success to they’ve been delivering a branded experience, i.e. their brand promises – fast, easy, cheap, and “The best service is no (need for) service” – repeatedly and consistently to such a superb level that no rivals can match, rather than customer centricity.